Enjoy the serenity of the private community of Southern Shores, while being just minutes away from the lull of the ocean. 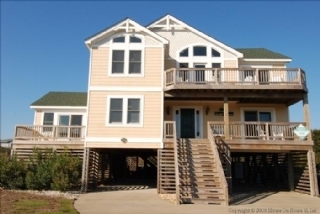 This spacious and comfortable Outer Banks vacation home has every amenity imaginable and allows the family pet to join the fun. Enjoy the large private pool and hot tub or just relax on the beach while listening to the waves crash. Extras include: Two outside private showers, outside bathroom, eight bikes, boogie boards, beach chairs and umbrellas, everything you need for the beach!! Level 1: Ground level entry. Level 2: Master Bedroom (queen) with television; Master Bedroom (two twins) with television; bedroom (duo) and bedroom (queen) with television share full bath; game room with game table & air hockey, wet bar, large television and deck access. Level 3: Master Bedroom (king) with television; Master Bedroom (king) with television; Large kitchen with deck access leading to a furnished screened porch; dining area; great room with fireplace; half bath.